Hostile mail – especially email – has become much more common over the past decade. Most of this mail is just “venting,” and has little real significance. However, when people are involved in a formal conflict (a divorce, a workplace grievance, a HOA complaint, etc.) there may be more frequent hostile mail. There may be more people involved and it may be exposed to others or in court. Therefore, how you respond to hostile mail may impact your relationships or the outcome of a case. Much of hostile mail does not need a response. Letters from (ex-) spouses, angry neighbors, irritating coworkers, or attorneys do not usually have legal significance. The letter itself has no power, unless you give it power. Often, it is emotional venting aimed at relieving the writer’s anxiety. If you respond with similar emotions and hostility, you will simply escalate things without satisfaction, and just get a new piece of hostile mail back. In most cases, you are better off not responding. However, some letters and emails develop power when copies are filed in a court or complaint process – or simply get sent to other people. In these cases, it may be important to respond to inaccurate statements with accurate statements of fact. 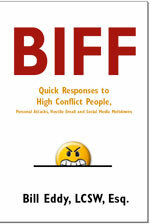 If you need to respond, I recommend a B.I.F.F. response: Be Brief, Informative, Friendly and Firm. For a full copy of this article and a preview to our upcoming book: email us at info@highconflictinstitute.com w/ subject: Please Send Biff Article!. http://www.highconflictinstitute.com/.